What is the course all about? KnowledgeHut conducts CSD certification in Chennai for corporations & also professionals. The material of CSD course in Chennai offers detailed information on the basics, roles and framework of Scrum, vital for professionals already working in Agile-oriented organizations or companies eager to embrace the Scrum method. Benefits of the course The CSD training in Chennai conducted at the KnowledgeHut coaching academy or online Institute is based primarily on making a strong contribution to team work and excellence in project management. After the completion of the certified scrum developer training in Chennai, the professional will be armed with new techniques and skills that can enable him/her to make any industry project successful. 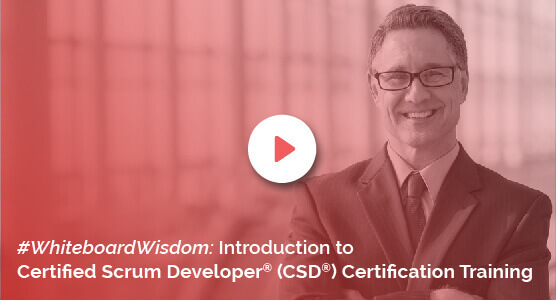 A mention of certified Scrum developer certification in a resume will make a professional stand ahead of the curve in the career workforce. The KnowledgeHut Way The CSD certification in Chennai is conducted by KnowledgeHut?s reputed project management trainers or tutors. In fact, the CSD training in Chennai workshop will be not only a lecture, but rather a real-example practice session that can make the Scrum practices successful in any industry. The fees, i.e., the total cost for the course are considered nominal with effect to the benefits a professional gets after certification and the enrolment/registration starts prior to announcement of classes.